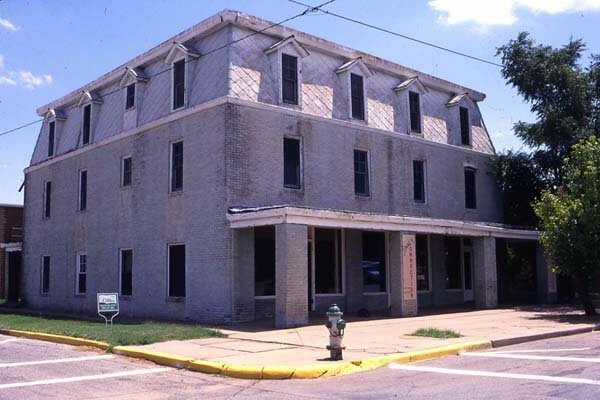 The Runnymede Hotel as it appeared after its move to Alva, Oklahoma. The hotel was named the Hendrickson on its arrival and went through several owners and names over the years. 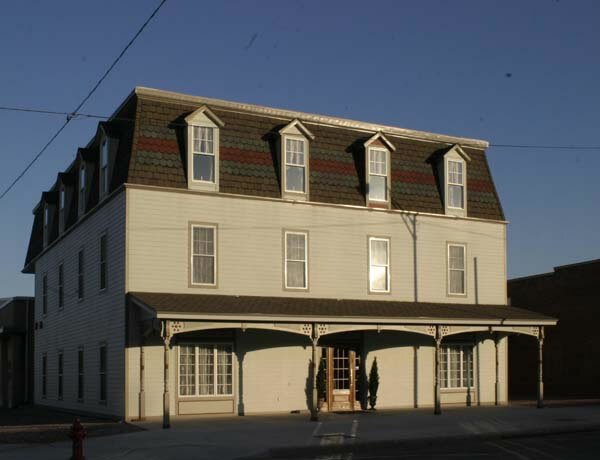 The Runnymede Hotel, the village’s most important structure was purchased by three businessmen from Medicine Lodge; Kansas, and two months after the opening of the Cherokee Strip in Oklahoma and the birth of the town of Alva, in September, 1893, the third story was removed. One account tells of the building being moved by horses and wagons over unimproved roads, four rivers and other streams over what should have been an almost impossible journey for such a large building. Another account tells of the building being cut up in sections before it was moved but there is no evidence that the floor joists of the building having been cut into sections before it was moved. On December 31, 1893, just three months after the run, a New Year's Eve celebration was held in Alva in the Runnymede, now renamed the Hendrickson. 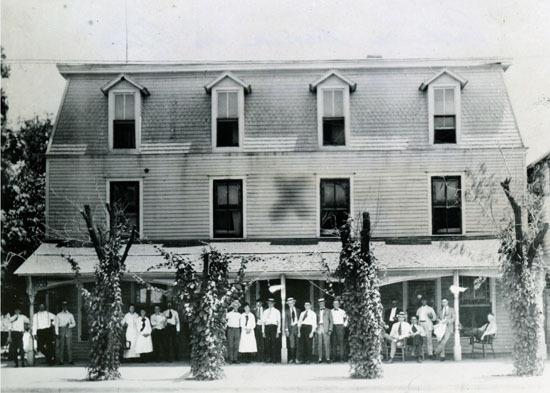 On January 2, 1894, the hotel officially reopened in Alva with a dedication banquet and ball. The hotel became the headquarters for many traveling salesmen who would come to Alva and set up their offices for several months at a time. Sometime prior to 1913 the name was changed to the Gunn Hotel. It was under this name that the hotel became famous again when Hollywood actor-producer William D. Taylor alias Tanner was murdered in California. It was revealed that he had stayed at the Alva hotel for a period of eight months before he returned to New York City. In 1929 the hotel was remodeled and the outside was bricked. During the late 1930's and early 1940's the hotel was operated by Charles Jason de Selms and it again was named Ye Olde Runnymede Hotel. A.L. Stanford operated the hotel known as the Runnymede from 1950 to 1956. In the 1960's it was purchased by Golden Crust Bakery owner, Joe Denner. 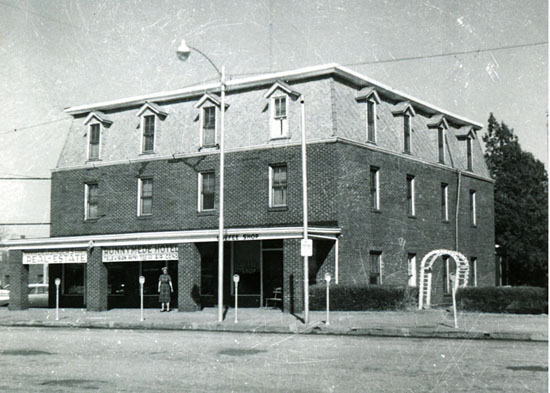 In 1964 the hotel part of the building was shut down but businesses continued to operate in the front of the building. Evelyn Kamas operated the ETC Shoppe from 1972 to1988 and she tells of how Joe Denner and his buddies spending considerable time playing dominoes. The second floor was headquarters for Alcoholics Anonymous for several years. Evelyn tells an interesting story of how a rope was on a table next to the window of each room and in case of a fire each occupant would have to quickly tie the rope to a solid object before going hand over hand down the rope until they reached the ground safely. The Runnymede Hotel as it appeared in the 1950s. Virginia Hooper, wife of the son of Hope Hooper, original proprietor, can be seen in front of the hotel. Visits with local law men in this later period indicate that the Runnymede Hotel was often a very lively site which resulted in the law needing to break up numerous fights. By the mid 1990s the building had become dilapidated from lack of maintenance. After overhearing a conversation telling of a plan to raze the building, a local preservationist, Dale Brown, put into motion a plan to save the building. Her vision for the building was that it could be restored and become a cultural center to the Alva community. She had grown up in New Jersey and learned to view old buildings as something to be treasured. Dale was a long time member, and several times president, of the Nescatunga Arts and Humanities Council and saw this group as the appropriate organization to lead the effort to restore the Runnymede to its former glory. In October, 1997, the Denner family listed the building for sale and in February, 1998, a Restoration Committee was formed and in November of the same year purchased the building for the purpose of renovating it for use. In January, 1999, the Restoration Committee received a grant from the Morton Share Trust to pay for the structural stabilization of the building. Public meetings to discuss its use were held during the summer of 1999, and,during the winter of 1999-2000, interior lathe and plaster was removed to determine where structural work was needed. Men from the nearby Bill Johnson Correctional Center assisted in this phase of the work. The Runnymede Hotel as it appeared in 1998, when acquired by the Nescatunga Arts Council. The hotel had fallen into disrepair. Dale Brown died in the fall of 1999, but the success of the Restoration Committee was a testimony to the good choices she made in getting good people to serve on the committee. The Runnymede Restoration Committee con- consisted of Scott Brown, Ken Brown, Billie Buckles, Jack Fisher, Joy Glass, Barbara Gordon, Jim and Melba Richey, and Richard Ryerson. Jim Richey, a prominent Alva artist, served as chairman of the Restoration Committee and helped build the unique and beautiful arches inside, and trim on the porch and posts on the front of the building. In addition to a modern kitchen and rest rooms an elevator was added plus a storage area used by the Nescatunga Arts and Humanities. Construction began in July, 2004 and continued through 2005. Roy Easley from Enid served as the architect and R.T. Grant of Hardtner, Kansas was the contractor. A beautiful picture of the old Woods County Courthouse painted by noted artist Lester Raymer was donated to the Restoration Committee and hangs in the lobby. Also hanging in the Runnymede are a number of small pictures of murals painted by the Alva Mural Society which appear on walls throughout Alva. The courtyard to the south of the newly remodeled Runnymede was enhanced 2007 when the Alva Mural Society has commissioned nationally recognized Oregon mural painter, Roger Cooke, to paint a mural of a 1907 street scene in Alva of a marching band. A life size bronze statue of the band leader playing a trombone as fashioned by noted sculptor Georgia Gerber, has been placed in a prominent spot in the courtyard. Blacksmith Mike George led a team of blacksmiths in constructing a beautiful Victorian forged iron gate and fence for the courtyard. The renovated building, now called The Runnymede as it appears today. The eight years spent in restoring the Runnymede to its former glory is an interesting contrast to the three months it originally took to build in Kansas; the two years that the Runnymede existed as part of an English community; and the two months required to move it to its final destination in Alva. It is also interesting to compare the Runnymede’s original construction cost of $4,800 to the renovation cost of over $650,000. Hopefully, the building’s story will never be finished and future events will add to its storied history. Website design by KMW Web Designs.